Utilizing the Call of Duty 4: Modern Warfare engine, Call of Duty: World at War throws out the rulebook of war to transform WWII combat through a new enemy, new tactics and an uncensored experience of the climatic battles that gripped a generation. As U.S. Marines and Russian soldiers, players will employ new features like cooperative gameplay, and weapons such as the flamethrower in the most chaotic and cinematically intense experience to date. 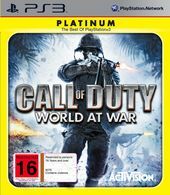 Call of Duty: World at War introduces co-operative play, bringing fresh meaning to the “No One Fights Alone” mantra with up to four-players online for Xbox 360, PS3 and PC, or two-player local split-screen on consoles. Nintendo Wii will also support a unique co-op mode for two players. For the first time ever players will experience harrowing single-player missions together for greater camaraderie and tactical execution. The co-op campaign allows players to rank up and unlock perks in competitive multiplayer by completing challenges and earning experience points, adding continuous re-playability and team-based gameplay. Whether playing competitively or cooperatively - if players are online with Call of Duty: World at War - they will always gain experience points. Based on a player’s experience rank and rank of the player’s friends, Call of Duty: World at War will scale dynamically to provide a deeper level of challenge. Call of Duty 4 Technology - Built using the Call of Duty 4: Modern Warfare engine, Call of Duty: World at War utilizes a bedrock of technology that delivers jaw-dropping visuals, while empowering players to employ elements like fire to affect the dynamics of the battlefield. Players that attempt to harness the power of new weapons, like the flamethrower, will find themselves capable of burning away environmental elements that give cover to a camouflaged enemy, leaving a charred battlefield - and their foes - in their wake. Coordinated Assault and Support - For the first time in the franchise, Call of Duty: World at War introduces co-op, bringing fresh meaning to the “No One Fights Alone” mantra. Call of Duty: World at War co-op features up to four-players online, or two-player local split-screen, allowing gamers to experience harrowing single-player missions together for greater camaraderie and tactical execution. The title also incorporates traditional multiplayer components such as challenges, rankings and online stats into the co-op campaign for deeper re-playability and advanced gameplay..
New Theaters of Operation - Players fight as U.S. Marines and Russian soldiers facing enemies - some new to the Call of Duty franchise - that employ lethal new tactics and know no fear, no mercy, nor the rules of war. Epic conflicts are fought on multiple fronts, playing through the climactic battles of WWII in the grittiest, most chaotic and cinematically intense experience to date. Innovative Multiplayer - Multiplayer builds from the success of Call of Duty delivering a persistent online experience for more squad based interaction. New development with party systems allows an intimacy with squad based combat never before seen in Call of Duty. Combined infantry and vehicle missions add a new dimension to the online warfare and offers more PERK abilities. Cinematic Quality Graphics and Sound - Treyarch’s award-winning sound department returns with effects that add to the already immersive cinematic intensity of the Call of Duty 4: Modern Warfare game engine. Remotely access news from the home front. Four new maps coming soon. Map pack features new Nazi Zombie level. NZ release one week away. "Fire & destruction" gameplay footage. Annual Activision event comes to NZ. Activision go back to the front lines.